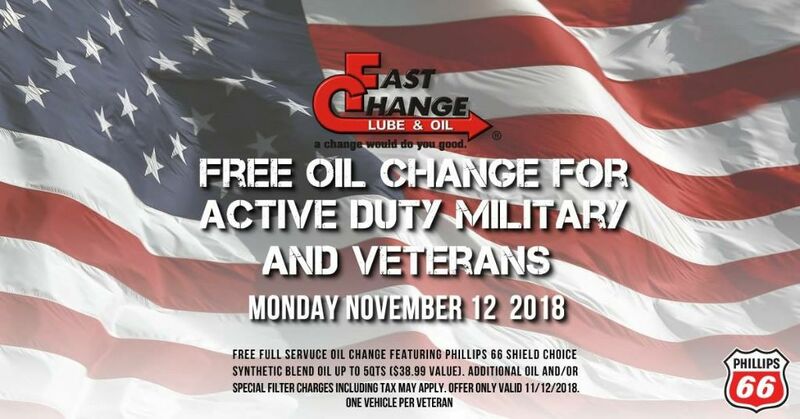 Free Oil Change to Active Duty Military and Veterans on Veterans Day 2018 – Fast Change Lube & Oil, Inc.
Fast Change Lube and Oil found an opportunity to give back to Veterans and Active Duty Military personnel on Veterans Day, Monday, November 12, 2018, by offering a free oil change service to the brave men and women who boldly serve our country. Fast Change has several veterans on its team including Matt McGlothin, a United States Army Veteran and manager of Fast Change Lube and Oil’s Mount Sterling store location. He says he served in the Army for eight years and thought the free oil change for veterans was a great success. Many veterans were impressed that Fast Change Lube and Oil not only held its annual Operation Solider Care Program, raising $30,000.00 through the donations of loyal customers to be sent to Military Missions, Inc. (a nonprofit organization that sends care packages to deployed soldiers) but offered a charge free oil change service. As an ongoing token of Fast Change Lube and Oil’s appreciation, customers who are active military or veterans always receive a discount on services at all Fast Change locations.